Welcome traders, today we will look at a couple of Oil futures (CL #F) charts. After reaching a short term top, patience leads us to a trading opportunity. 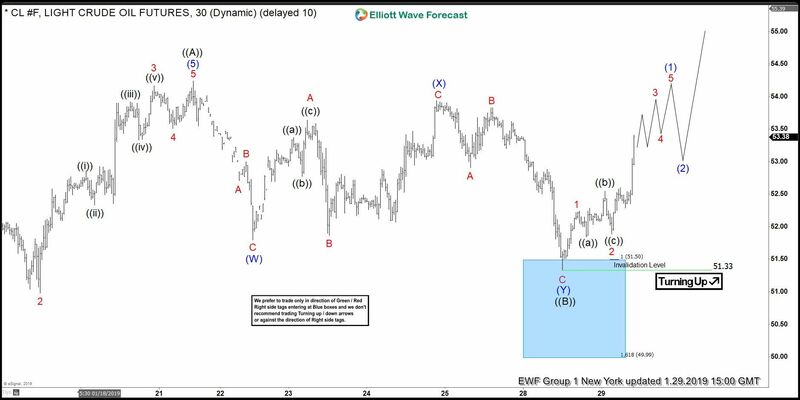 See how profitable and efficient it can be to trade with basic Elliott Wave analysis and our defined blue box target areas. First of all, we start on January 28 2019 with a 30-minute chart presented to our members. Here, we believe the market favors the downside in the near term solely based on our count. The top at $54.25, labeled as wave ‘((A))’, serves as a resistance after finishing a 5 wave move. 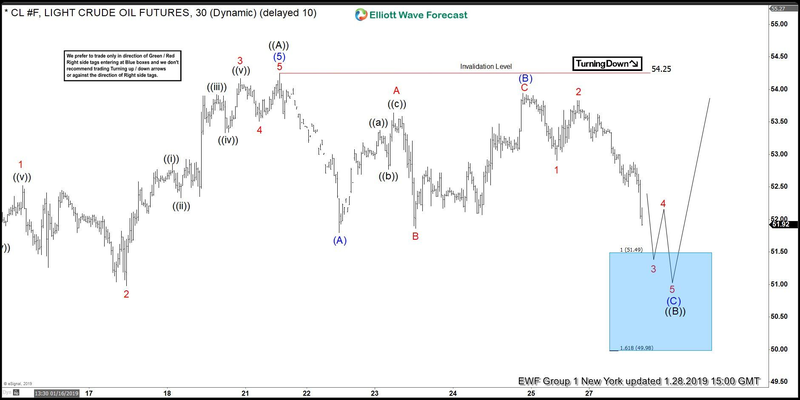 From there, based on Elliott Wave theory, a pullback is always expected. Due to the straight down pullback, followed by 2 bounces failing to break wave ‘((A))’, it led us to believe 3 swing pullback was developing. More specifically, an (A)-(B)-© Elliott Wave zigzag structure forming for wave ‘((B))’. Under our methodology, we do not take action with an unconfirmed ‘right side of the market’. This is the meaning of the black ‘TurningDown’ arrow. So, we let the market shows itself and we adapt our count to make sense of the price action. As soon as wave (B) was confirmed, we derived a 1:1 minimum target and a 1:1.618 extreme target. These targets are combined to provide a blue box target area where probabilities favor the instrument to react from it in 3 waves at least. Below you will see an updated chart of oil a day after, January 29 2019. Note that the count changed but the setup remains the same. So, as expected, with a complete 7 swing pullback, oil has potentially resumed the dominant trend. If anyone happens to buy the pullback at the blue box, they already have a risk free trade. Now as far as the $51.33 invalidation level remains intact, we expect further upside. Once again, our blue box target areas showing how accurate they can be.